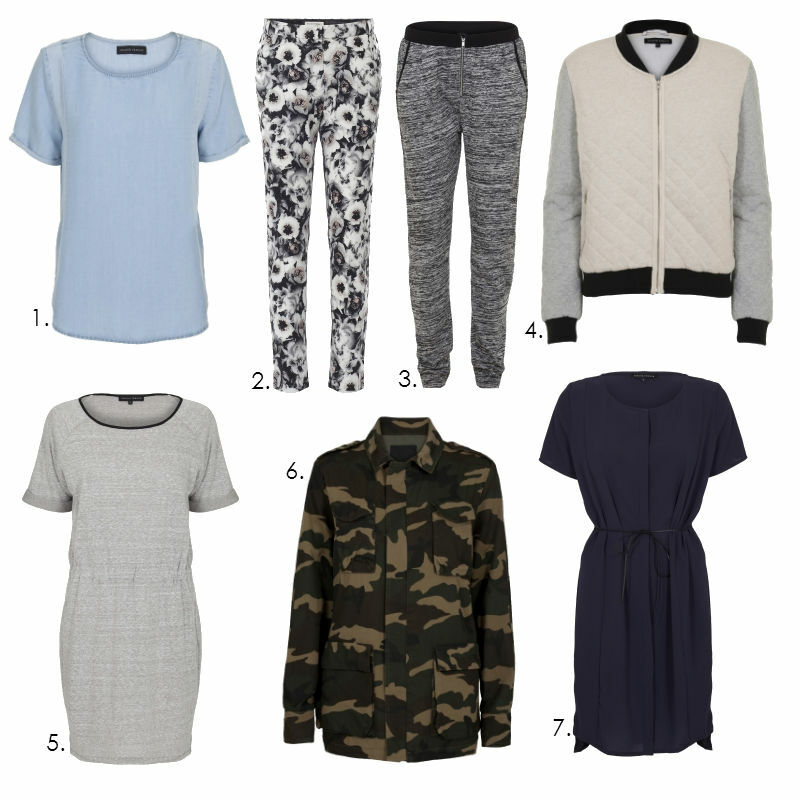 Top row L-R: Leopard print pony sandals, Next, £35. Leopard print sandals, £29.99, Zara, Primrose Leopard sandals, Stylistpick, £25. 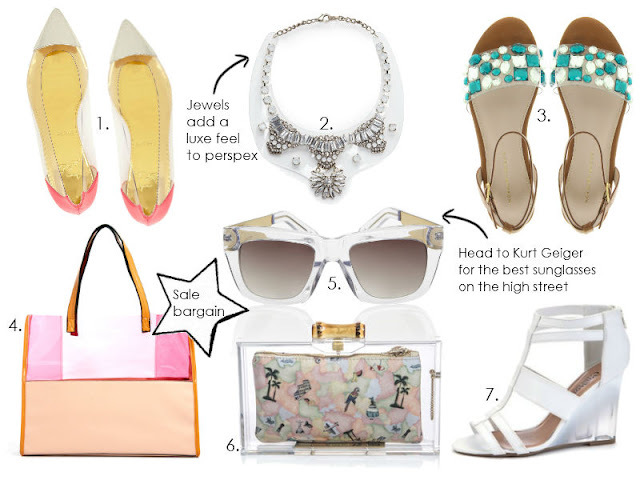 Middle row L-R: Bertie Leda white sandals, John Lewis, £56.25. Flock flat leather sandals, ASOS, £22. Ancient Greek Clio sandals, Matchesfashion, £105. 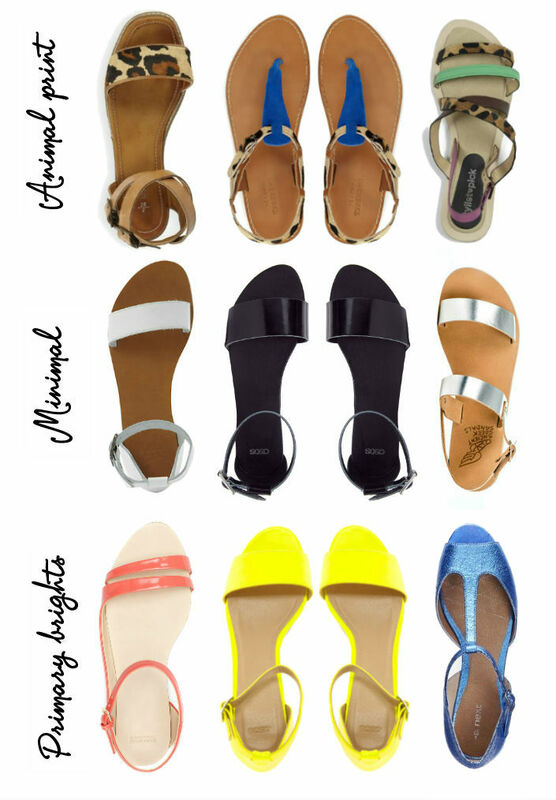 Bottom row L-R: Coral asymmetric flat sandals, Zara, £22.99. Hedley heeled sandals, ASOS, £45. Metallic blue t-bar sandals, Next, £26. 1. Chinti & Parker striped organic cotton top, Net-a-porter.com, £80. 2. Yellow Broderie Breton top, Jaeger, £50. 3. Tall Breton stripe tee, Topshop, £16. 4. White and green stripe Broderie top, Awear, £16. 5. Hartford Tarquin anchor tee, Atterley Road, £39. 6. 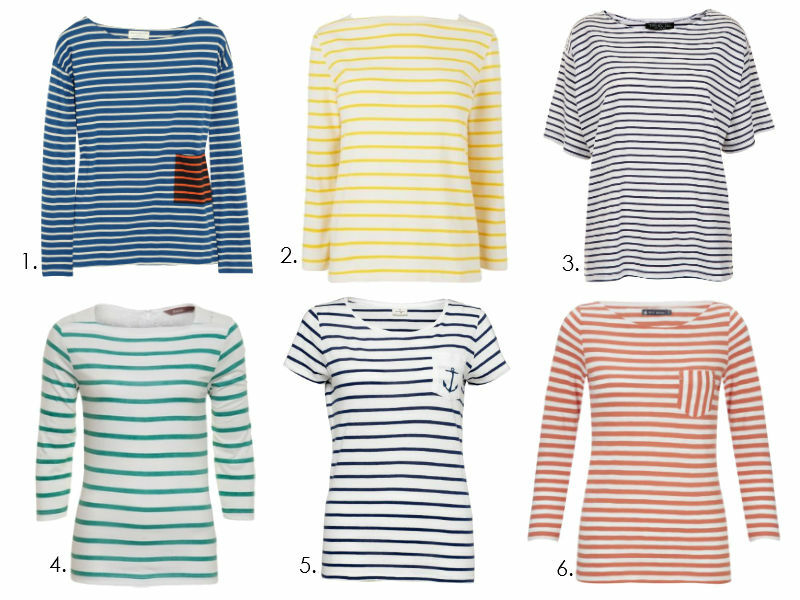 Petit Bateau Tuba striped top, Atterley Road, £45. It's press day season right now and LFF has been zipping around London checking out what's in store for the AW13. Whilst on my travels at the Bright Light press day last week, I came across an unfamiliar fashion brand that I found really wanted to share on here. Second Female is a Scandinavian brand that aims to deliver the newest catwalk trends at affordable high street prices. 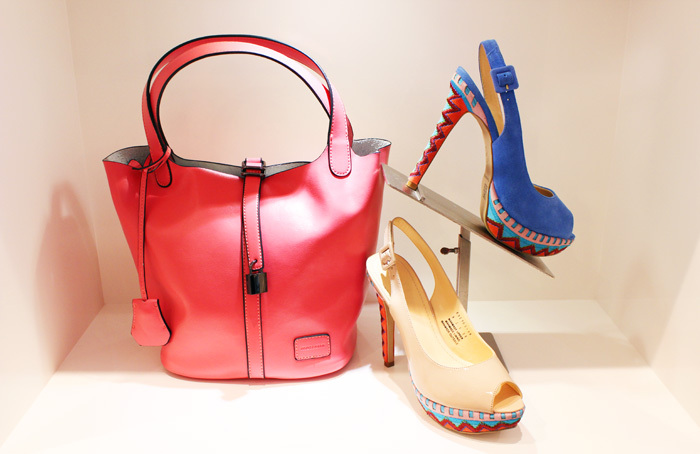 Think of the laid-back Whistles aesthetic combined with the design-led Cos approach and that's the Second Female look. 2. Cirkeline floral pants, £66. 5. Inna sweat dress, £66. 6. Black camo jacket, £102. I’ve had some dire hairdressing experiences in the past year. After a particularly appalling hair cut in December (I ended up with a ‘Lego’ haircut – you know, the kind of angular style only a Lego figure sports), I decided to go on strike and forgo hair salons for good. So after 6 months my hair ended up in the sorry and confused mess that you see below. Recently, I realized an intervention was needed; I could no longer swan around fashion events looking like something the cat dragged in. Which is where Urban Retreat comes in. 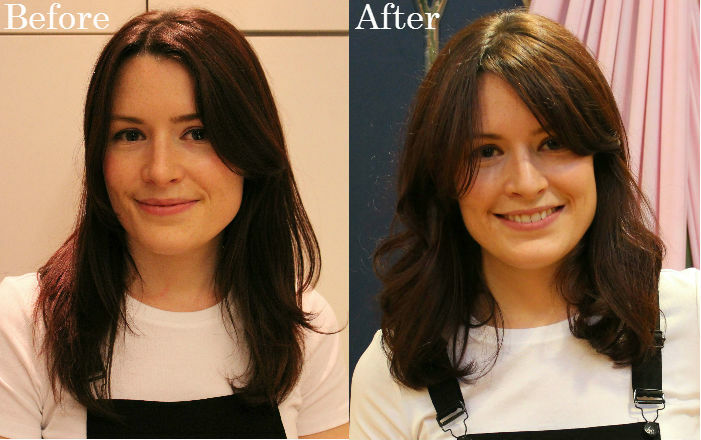 I received a super-swishy blow-dry courtesy of Urban Retreat and Fashion Monitor at LFW, so I reached out to them to see if they could help me overcome my hair restyling phobia. UR kindly obliged and booked me in for an appointment in their Harrods salon. So you might think it would be slightly intimidating to get your hair cut in Harrods. And I am not going to lie; I did feel a little nervous on my ascent to the 5th floor salon/spa. However any nerves I fast melted when I met my lovely and extremely charming stylist Josh. Harrods’ PR Marie had suggested I book in with Josh if I was looking for a fashion-forward hair style and I am so pleased that she did; Josh was young, full of enthusiasm and a whole lot of fun! The style I had settled upon for my new look was grown out bangs ala Alexa Chung. I bought a magazine tear-out to illustrate my point, but Josh barely needed to glance at it because he already knew the look I wanted. ‘Don’t worry, you are going to look HOT’ he assured me. Which, is what every girl wants to hear from their hairstylist isn’t it? I don’t need to understand the science behind my follicles, just make me look good and I’ll love you forever! Photo creds: Susi Smither and Katie Jackman. I asked Josh if he thought the fringe should be side-sweeping (my comfort zone) and he recommended a softly centre-parted style because ‘it’s sexier to show a bit of skin’. After my shampoo, I came back to find a world-famous red head seated near to me receiving a blow-dry. I always associate Harrods with celebrity clientele and was amused to find my point proved. The hair cut itself was a super-speedy 20 minutes, during which Josh asked me if I was excited several times (I really was!) and if I felt ‘Chung-like’ yet (I did!). Blow drying took a further 10 minutes during which Josh used techniques he had picked up on a recent trip to Brazil to create softly tousled waves. Once dry, he trimmed my fringe and finished the look off with the smallest amount of hair spray; this impressed me since there’s nothing worse that leaving the hairdresser with head full of gunky product. An efficient 45 minutes after taking my seat and the restyle was complete, which meant I still had time to make a party I had been invited to in the Kings Road Anthropologie store. 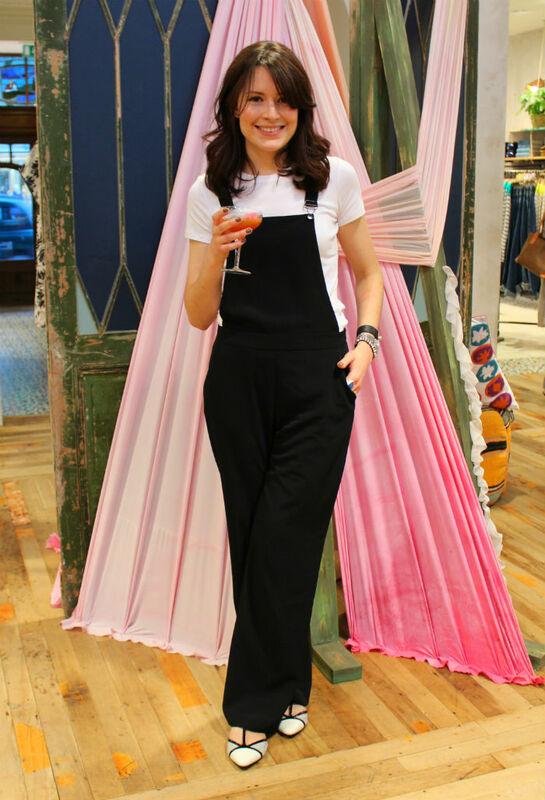 Dungarees: River Island. Shoes: Next. 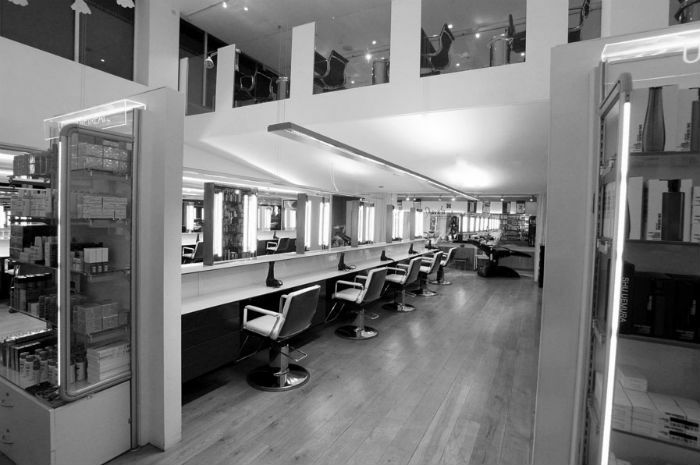 A women’s cut & restyle at Urban Retreat Harrods starts at an affordable £60, for further information visit the website. If you are lacking in SS13 wardrobe inspiration, then look no further that the latest ASOS Africa collection. This fashion range encapsulates what great summer style is all about; soft and slouchy silhouettes, global traveller prints and elegant separates that can be easily mixed and matched. Take the sheer panel midi dress; add a pair of gladiator flats and designer shades and there is the outfit made. Avoid the temptation to over style with jewellery; simplicity is key to keeping detailed pieces like this looking modern. LFF recommends in investing in a few Africa pieces to build a capsule summer wardrobe that will work for seasons to come; this is an ageless and timeless collection. My mum religiously reads my blog (hello mum!) and I think she would look stylish in the cropped zip-front jacket (no.2 - not available on line just yet). And the best bit? ASOS Africa is produced in collaboration with SOKO Kenya, allowing communities to establish sustainable business through local craftsmanship so by making a purchase you are supporting a great initiative too. 1. Printed midi dress with sheer panel, £50. 2. Jacket not online yet. 3. Trousers in Kenga print, £40. 4. Floral dress with mesh detail, £45. 5. Top not online yet. 6. Printed loose fit trousers, £40. 1. 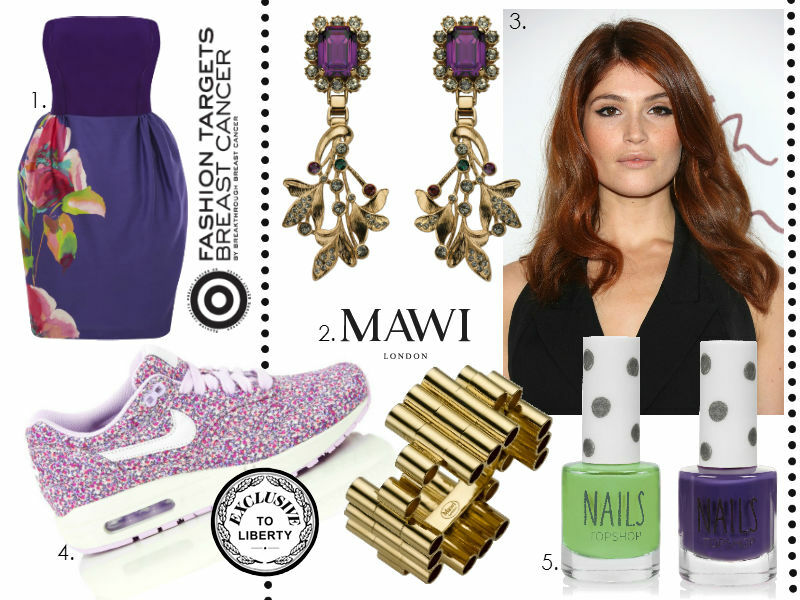 Doing some charitable shopping thanks to Fashion Targets Breast Cancer. A whole host of brands are taking part in the campaign this year, including my-wardrobe.com, Warehouse and River Island. LFF loves the Coast Bee dress, perfect for your summer soirees. 2. Heading to the Mawi sample sale which is on today for one day only (Friday)! Hot foot it to Dalston to invest in some wear-forever statement jewels. 3. Planning a hair restyle. I have cut and colour appointments over the coming weeks which I will be reviewing on here. 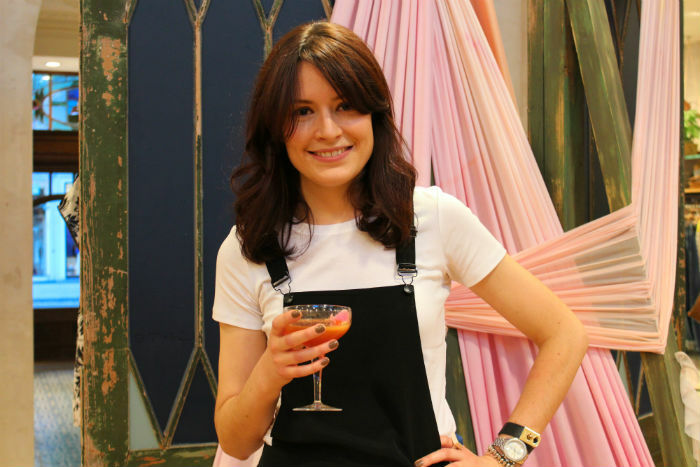 One option I am considering is dying my locks an auburn hue for summer like my style icon Gemma Arterton. 4. Getting my kicks with the latest Nike x Liberty collaboration. The new sneakers launched this week and are sure to sell out sharpish. 5. Painting my talons with the latest Topshop nail polish shades. The high-street brand are really on their beauty game right now; I am loving the apple-green Rad for day, whilst the sultry Late Show will look great after dusk. 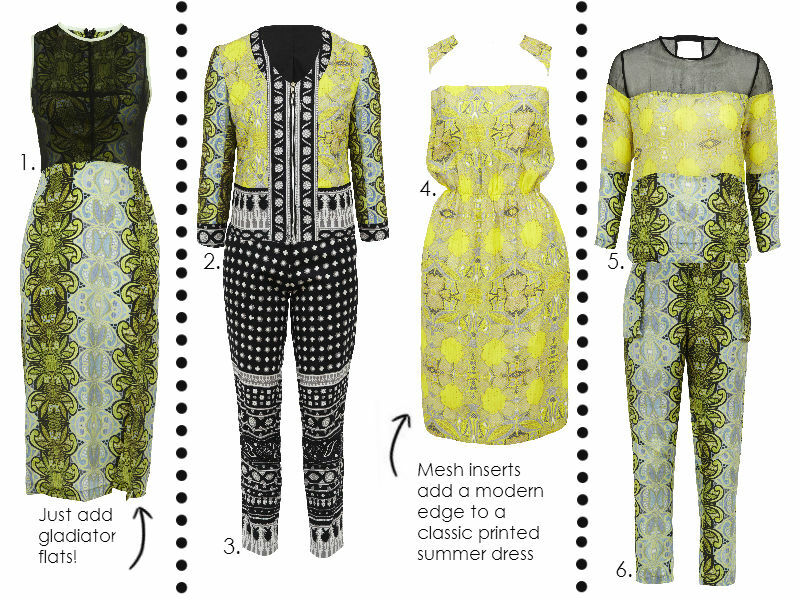 One of the most fun and playful trends this season is fashion’s obsession with transparent materials. Perspex, PVC, vinyl and acetate are the weapons of choice, seen in numerous spring/summer collections in the form of hard-case clutches, transparent heels and sunglasses frames. From Marc Jacobs through to Valentino and Louboutin; some of fashion’s best loved accessories designers have subverted from the classic materials and embraced the plastic and the fantastic. 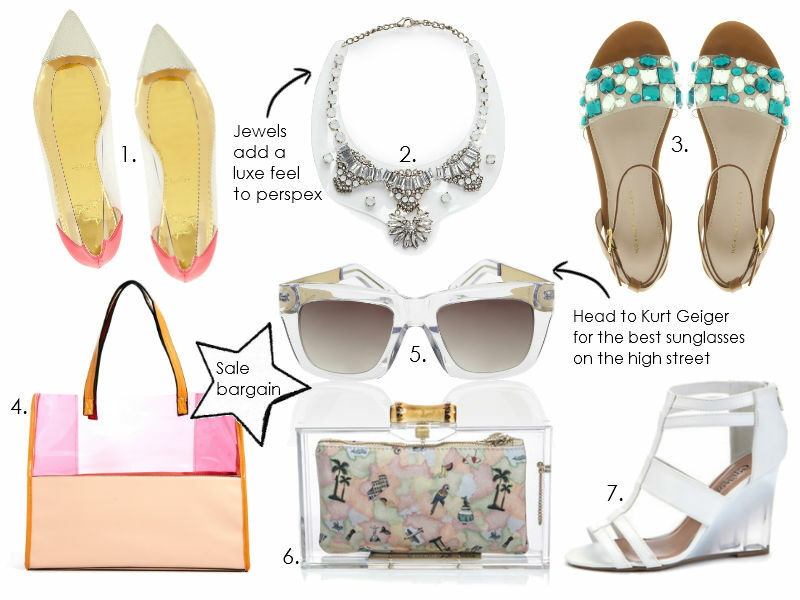 On the high street head to Kurt Geiger for a luxe take on the trend; PVC strap sandals are embellished with colourful jewels (no.3) and acetate frame sunglasses (no.5) offer the high-end look for less. High street favourite Mango has carried the look through into their jewellery collection with a crystal-detail statement necklace (no.2) that has proved a big hit with the fashion crowd. Have you tried the plastic fantastic look yet? 1. Louboutin Corbeau PVC detail flats, Net-a-porter.com, £375. 2. Crystal embellished transparent necklace, Mango, £29.99. 3. KG Kurt Geiger Noble flat sandals, ASOS, £90. 4. Johnny Loves Rosie tote bag, ASOS, was £80 now £48. 5. 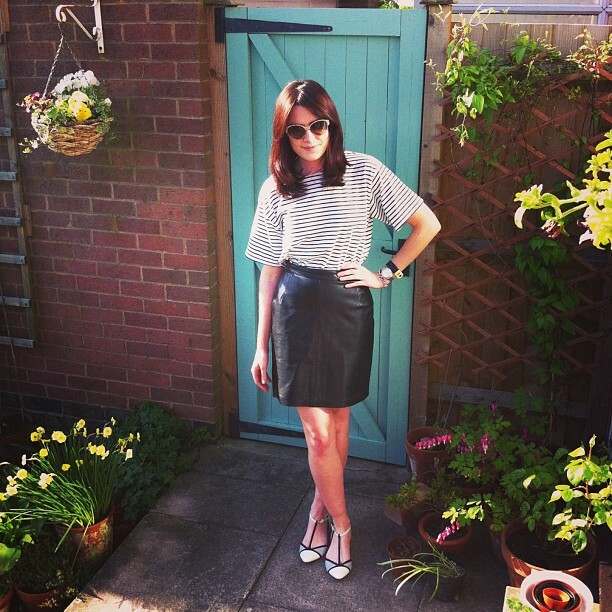 Danni chunky sunglasses, Kurt Geiger, £60. 6. Charlotte Olympia Pandora box clutch, Matchesfashion.com, £545. 7. White perspex wedges, New Look, £34.99. 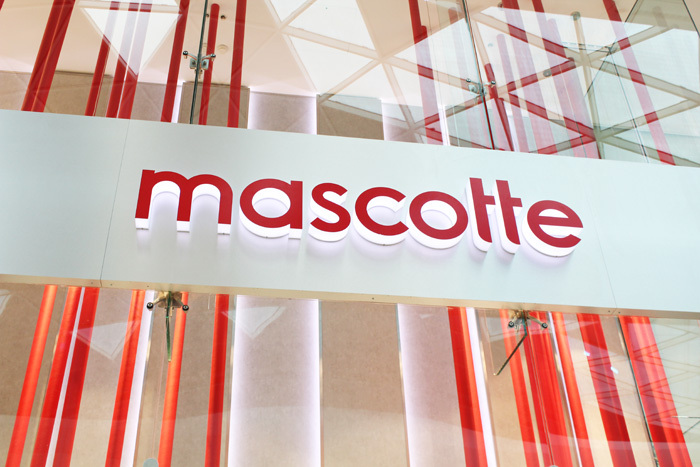 Recently LFF was lucky enough to be one of a handful of fashion bloggers, journalists and stylists invited to have a sneak preview of Westfield London’s newest shoe store: Mascotte. Whilst you may not be familiar with the name, Mascotte happens to be one of Europe’s biggest footwear brands and is poised to leave a fashionable footprint on the UK market in 2013.